Brisbane author Ian Townsend knew the story of the firing squad death of Australian child Dickie Manson in 1942 had to be told. WHEN first hearing the story of an 11-year-old Australian boy executed by the Japanese as a spy in World War II, one can't help but think two things: this is shocking, and how have I not heard of it before? 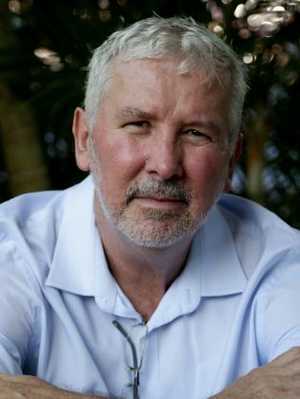 When he stumbled onto ­details of the firing squad death of Dickie Manson and his mother Marjorie in May 1942, Brisbane author Ian Townsend, 56, thought exactly that. The result is his book Line of Fire, published by Fourth Estate this month. Author of two works of fiction, Affection (2007) and The Devil's Eye (2008), both of which told human stories set in times of national disaster, Townsend initially planned to follow a similar path with his third book - invent a family, put them in a wartime setting, and build a plot around them. And then he discovered Dickie Manson. 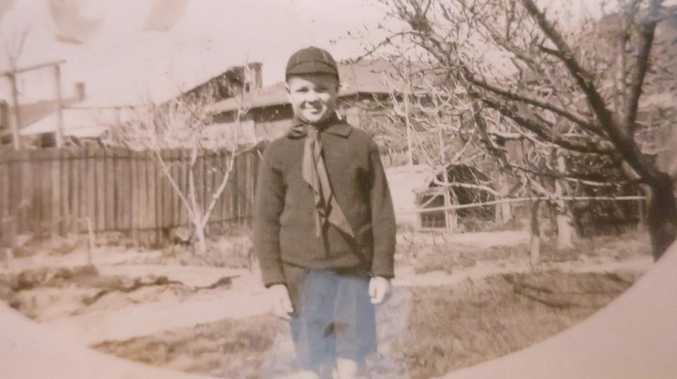 Born in Melbourne, educated for a short time in Brisbane at Fortitude Valley Boys' School and then taken by his mother to the-then Australian territory of New Guinea a year before the Japanese invasion, Dickie was court-­martialled and executed soon after his 11th birthday. For 75 years, the facts behind his death have been a painful mystery to his relatives back in Australia and a long-forgotten footnote to one of the most shameful episodes in Australian military history. If not for Townsend's curiosity and ­research skills, they would have remained that way. 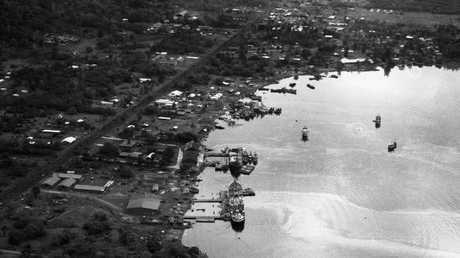 Famous for its volcano and spectacular harbour formed in a volcanic caldera - or crater - after an eruption about 1500 years ago, Rabaul was also of major strategic value during the war, leading to its bombing and subsequent occupation by the Japanese in January 1942. "I'd always wanted to write a book about 1942 and set it in Queensland," says Townsend as he leans back in a lounge chair at his home in Brisbane's northwestern ­suburb of The Gap. "When you listen to people talk about the war years on the home front in Australia, it seems like there was something almost attractive about that time; it was like they felt quite alive with the ever-present danger of the Japanese, who everyone thought would try to invade. "I like the idea that when people feel they are at risk, a lot of interesting things come out, so that's why I thought of 1942. Then I started looking at Rabaul as a ­result of that, because during the bombing up in north Queensland a lot of the planes were coming from there. "The more research I did about the Battle of Rabaul, the more I wondered why people don't know much about it, so basically I thought I'd do some research and set my book in Rabaul … and then I came across this family." Once he unearthed snippets of information about the trial and execution of Dickie, Marjorie, 29, her partner Ted Harvey, 54, Marjorie's brother Jimmy, 27, and plantation manager Bill Parker, 43, any thoughts of another novel were scrapped. The truth was far stranger, and much more compelling, than fiction. "The fact that they were shot was in some of the military histories of Rabaul, but there wasn't much about it, just a few paragraphs, and this family was so intriguing I couldn't fictionalise it. I felt I had to find them." Rather naively, he now admits, Townsend thought this would be a relatively easy task: just track down ­relatives in Australia and ask them everything they knew. It proved anything but simple. Manson was Marjorie's ­maiden name. Unwed at the time of Dickie's birth, she later married his father, Jack Gasmier. Later she left Gasmier and moved to Rabaul to be with copra plantation owner Harvey, taking his name during her time in New Guinea. "I ran into a brick wall because they changed their names so many times through the course of their lives - the little boy had three surnames in his short life - so tracking down all the references to these different people was very difficult. "It became a challenge in the end, but as a journo, if there is a barrier there you want to go past it. It became a personal thing. I was obsessed. I thought, why don't I know the story about Rabaul? "Why don't I know about this ­family who were executed for espionage and buried ­beneath a volcano? There was a three-day trial, why don't I know this? I thought, this is interesting to me, but will it ­interest other people? Then I thought, bugger it. I'm interested, I'd like to read a book about this, so I'll just pursue it." The chilling facts behind what Townsend believes is the only military court martial and execution of an Australian child were not too hard to piece together. The Australian government, knowing the Japanese were on their way to Rabaul, sent a ship to evacuate all women and children, while leaving the civilian men and the military ­garrison to face the enemy. Marjorie, fatefully, decided to stay. When the Japanese invaded, Marjorie, Dicky, Jimmy, Ted and Bill fled into the jungle. Betrayed by a local man, they were caught and searched. Ted had a two-way radio with him, with which he had been trying to contact Aus­tralian aircraft. Marjorie had hidden a pistol in her bag. They were court-martialled, found guilty of espionage and, on May 18, 1942, driven to the base of Tavurvur ­volcano in the back of an open truck. Marjorie tied a strip of red material, cut from a native lap-lap, around Dickie's head to cover his eyes. They were led from the truck and lined up. 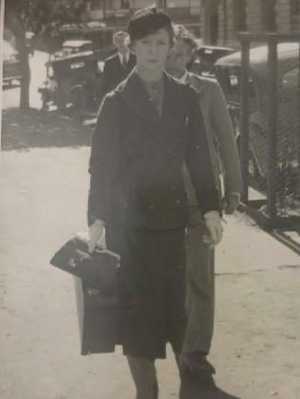 Marjorie held one of Dickie's hands, Ted Harvey the other, and on the order of Japanese naval officer Mizu­saki Shojiro, a firing squad of six soldiers shot them dead. That much could be gleaned from eyewitness reports given to Australian authorities investigating possible war crimes after the war. For the real story of Dickie Manson and his mother, who they were and how they came to be buried under a volcano in New Guinea - and through them the story of ­Rabaul and Australia in 1942 - Townsend had to dig deeper. His obsession took him to national archives around the country, old military files and newspapers and on a trip to Rabaul. The breakthrough came when he found a ­reference to Marjorie's brother George, who had been in Rabaul but joined the volunteer militia and fought alongside Allied troops when the Japanese landed. He then sought refuge in the jungle for about three months before later being evacuated by the military to Australia. "I didn't know George existed when I started looking because he wasn't mentioned in the military histories, but when I came across him I thought, did he survive the war? I started going through old newspapers online, and his name popped up. He was engaged after the war in Adelaide, so then it was 'great, he survived the war, maybe had kids'." Townsend found a newspaper article about a reunion of people who had been in New Guinea before the war. ­George had attended, but the eureka moment came when the article included a quote from a Beverley McLean in which she said, "My father, George Manson … "
And so the search continued. McLean is a common name, and Beverley and her family lived a long way from Adelaide, in northern NSW, but finally Townsend found her and, through her, Marjorie's third brother Graham, 94, the only person still alive who could tell him first-hand about Dicky and Marjorie. "He is still grief-stricken today," says Townsend, who spoke to Graham Manson at his home in Sydney. "He finds it very difficult. He can talk about them before the war but if you start to approach the war with him he becomes very upset and he physically doesn't seem to be able to speak. He wants to but he can't. "He didn't know much about what happened in Rabaul himself because all that was kept from the family by authorities, so I wanted him to describe what Marjorie and Dicky were like before the war. I needed that personal ­information so I could paint a picture of them because so little remains. They live in him." Townsend believes the Australian government suppressed details of what happened to the civilian men left behind in Rabaul - most of whom died - because of shame over not evacuating them when it had the chance. The lack of information shared within the Manson family was due to the most powerful of all emotions: grief. Marjorie's mother Phyllis was shattered by the deaths of her daughter, son and grandson. In her pain she destroyed any documents, personal letters or photographs that reminded her of her loss. In 1956, she committed suicide at the age of 65. It was left to a journalist from Brisbane to sift through 75 years of volcanic ash to find the truth. "When I gave the book to Bev she read it a couple of times and she rang me up and said, 'for the first time I know who they are', and that was great. It's nice to help people. The war crimes case was dropped so the family never really got justice, but I think this story being told means anyone who is interested can have an understanding of what happened, and that's important.